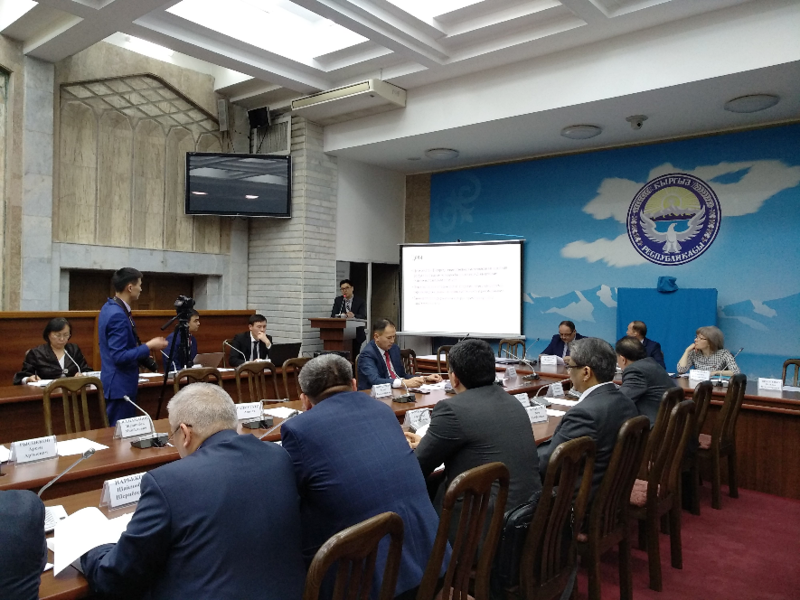 On March 1, the Parliament (Jogorku Kenesh) of the Kyrgyz Republic held public hearings on the draft law “Taza Aba” (“Clean Air”). The deputies, as well as the ministries, wanted to know the opinion of experts on the situation with polluted air in Kyrgyzstan and Bishkek before proceeding with the drafting of a law to combat air pollution. CED AUCA presented the results of its study that was done in 2018 on the sources of air pollution in Bishkek and Osh. According to the results of the study, there are three main sources of air pollution in Bishkek: vehicle exhaust fumes; air pollution from burning solid fuels when heating private housing; dust and fine particles (PM 2.5, PM10). Dust and fine particles are the particular reason for the increase in the number of lung diseases (colds, asthma, pneumonia, allergies), as well as heart diseases among adults and young Bishkek residents in recent years. – One of the sources of air pollution is that a) there are a lot of cars in Bishkek; b) there are a lot of old cars in Bishkek. The number of registered cars in the capital from 2013 to 2018 increased from about 240 thousand to more than 400 thousand. This is more than in London. At the same time, 92% of the vehicles, according to the results of our research, are 10-15 years old and even over 15 years old, said Rahat Sabyrbekov, CED director. On summer 2017, in Bishkek was held the research on transport roads’ situations with the use of modern scientific methods. At the result, two models was worked out: first model sets the factors of giving bribe to the patrol officers, the second model determines the factors of having traffic accidents. This research became possible to implement with the support of “Soros – Kyrgyzstan” Foundation. CED in partnership with TSPC AUCA is conducting a green economy learning assessment for the Kyrgyz Republic funded by the Partnership for Action on Green Economy (PAGE) initiative. The assessment is focused on the learning needs of policy makers in key sectors (clean energy, sustainable agriculture, sustainable private finance) and academia. The assessment methodology is based on the Guidance Note prepared by the UNITAR and verified with stakeholders and with the assessment task team. The data for the assessment is being collected through a desk review of relevant policy documents and reports; surveys and individual interviews of policy makers; case studies, and review of existing study programs in universities relevant to a green economy. Round table on green economy learning priorities with policy makers. Seminar on current state of green economy teaching with local universities and representatives from the Ministry of Education.